Lead your team to excellence! These three areas are important for managers in order to accomplish the UC mission by leading and engaging staff in the attainment of strategic and operational goals which enhance individual accomplishment and reinforce organizational excellence. This is an energizing program relevant to the demands facing University managers, benefiting managers who manage other managers, supervisors, and leads of complex programs or projects. The program is designed for middle- to upper-level managers. Senior leaders also benefit and are encouraged to attend. The program on the UC Santa Cruz campus is comprised of three partial-day sessions completed over a period of three weeks. 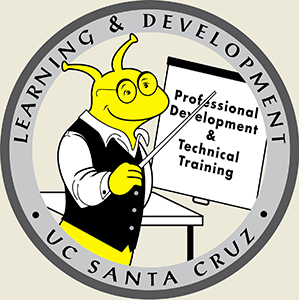 Currently, UCSC is offering two of the three Modules for the MDP Program. Note: Supervisor approval is required for participation. After you sign up, an email will be sent to supervisors for approval. Please have your FOAPAL ready before you register, as it will be required at the time of sign-up.